Don Aase made his major league debut for the Boston Red Sox on July 26, 1977. I don’t think it would be accurate to say he was a phenom. Five years earlier, he’d been drafted on the sixth round by the Red Sox, who shipped the 18-year-old to their Williamsport affiliate in the low minors, where he went 0 and 10 with a 5.81 ERA. After that demoralizing start he began a solid, gradual, unspectacular rise through the Red Sox system. The records on the back of the card pictured here seem to indicate that in the first half of 1977, while pitching for Triple-A Pawtucket, Aase slid back toward the ineffectiveness that had plagued his first pro season, his ERA over 5 again for the first time since his Williamsport days. Why then would the Red Sox choose to rush him to the big leagues to start a game in the middle of what was turning out to be a white-knuckle three-team pennant race? I was nine years old by then, and had listened to many of the Red Sox games so far that season on the radio. They all seemed to be the same game. As the signal rose and fell through static, the Red Sox surged to a huge lead with a barrage of home runs, then allowed the lead to erode as their pitchers crumpled. By July 26 the Red Sox had fallen out of first by losing three games in a row by the following scores: 9-8, 9-6, and 9-7, a pace capable of yielding them a record-breaking number of runs in a season and a perversely spotless 0-162 record. It was clear that they could not win a pennant this way. In short, they needed help. A lot of help. But all they had was Don Aase. The youngster instantly exceeded expectations, tossing a complete game 4-3 win. The following day the Red Sox returned to their recent script by getting bludgeoned 14-5, their bullpen again getting chewed like a speed freak’s hunk of Bazooka. They needed someone to at least give them some innings in the finale of their three-game series with Milwaukee, and turned to another unheralded rookie who had started the season in Pawtucket, Mike Paxton. Paxton had been called up from the minors earlier in the season and to that point seemed the prototypical Red Sox hurl-inducing hurler, compiling a 6.16 ERA as a mopup man and spot starter. But something was in the air. Whatever pixie dust had landed on Aase on the Peter Pan Lines busride from Pawtucket to Boston must have rubbed off on Paxton, who tossed a sparkling 12-0 shutout. Aase then blanked the Angels 1-0, and two games later Paxton topped Seattle, 12-4, then Aase kept the Red Sox rolling with his next start, a 2-1 win over Oakland. Powered by the rookie aces, the Red Sox won 11 games in a row and reclaimed the division lead. 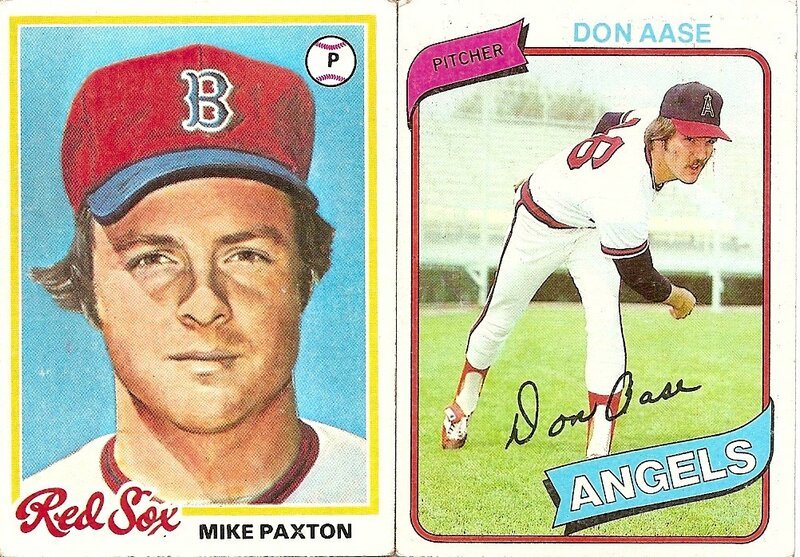 Yes, for just a little while, a thin breathless era that remains one of the more golden strands of my childhood, it seemed that Mike Paxton and Don Aase were going to carry the Boston Red Sox to the pennant. It didn’t quite turn out that way in the end, as they weren’t able to quite continue their blistering midsummer pace, nor in general fully counteract the serious flaws in the Red Sox pitching corps. But Aase and Paxton both turned in admirable rookie years, going 6-2 with a 3.13 ERA and 10-5 with a 3.83 ERA, respectively. More than that, for me anyway, Paxton and Aase will forever be among the most exciting duos in baseball history. I was nine when they arrived, and to that point few things had caught my imagination as much as their sudden transformation from complete nonentities to season-rescuing heroes. They were young. I was young. They had been unknown. I was unknown. They seemed to have arrived in the spotlight from the middle of nowhere. I lived in the middle of nowhere. The sky was the limit, for them, for me. As it turned out, the sky was the limit, but that sky was the leaden, unbreathable blue seen in the Mike Paxton card above. Neither player went on to stardom with the Red Sox. In fact, neither player was even on the Red Sox roster the following year. By the time I got the 1978 Mike Paxton card featuring his lifeless putty-like skin and oddly bulbous cap I had noticed that Mike Paxton no longer seemed to exist in the games I listened to on the radio and in the box scores I read in the paper. I didn’t know he’d gone to Cleveland as part of the deal to bring Dennis Eckersley to Boston. I only knew he was no longer around. This card, arriving amid Paxton’s troublingly sudden disappearance, must have made me wonder if Mike Paxton had ever been there at all. I’d never actually seen him, after all, but had just heard his name on the radio, and beyond that had only fervently, maybe even desperately, imagined him. And now here he was on his card, not quite real, looking starkly different from the players in any of my other cards (with the disturbing exception of the sepulchral Greg Minton). The question arose: Was there ever really a Mike Paxton? There seemed to be no inarguable proof of the affirmative to that question, which gave rise to another question with ripples deep enough to stretch from 1978 to right now: If there never really was a Mike Paxton, how can I be sure of anything? As for the even briefer and brighter-burning comet of 1977, Don Aase, his only appearance in my collection came two years later, in 1980, during my last real year of collecting. I was older by then. I understood that guys who burst onto the scene with great initial success don’t always become superstars. Hopes fade, dreams gutter. Life goes on. Don Aase was just another guy on a baseball card, just another guy with a mustache, just another guy halfheartedly pretending to throw a baseball. You are currently browsing the archives for the Mike Paxton category.